I build arcade machines for a hobby and figured it would be neat to write an arcade program of my own to go inside. Moon Base Alpha is a java applet so you can just click this link and start shooting It currently keeps a global list of high scores so you can see how good you are. Mother ships provide the power ups while the aliens get more devious as you climb the levels. if anyone has time then I'd like to hear some constructive criticism or ideas on how to improve it. I'd also like to know if you get any stuttering during play and, if so, what type of hardware you're using. It's about 200k so you might need to wait 5 seconds for it to load. Hope you enjoy playing! It ran fine for me, only problem I noticed was my bullets would pass through the power-up type ships. The normal bullets should stop on hitting an alien however the green torpedos will spear everything in their path until they go off the screen. I'll double check the code though just to make sure the normal bullets are behaving themselves. Thanks for the feedback. Did you find the game too easy or too hard (what score did you get)? I wasn't sure whether to add more types of "creatures" but figured the game would just become too complicated for too little benefit. What it needs is a bit of modernisation: I think it should run at a rock steady 60fps, have about 100x more particles, and for pity's sake don't use space bar to shoot!!! Modernisation - you mean gaming changed after the 1980's? what sort of features are you thinking of? remember it's supposed to be a "retro arcade shooter" and not GTA5 - the game is going to live in an arcade machine after all. By 100x particles do you mean the background stars - it would be easy to change but wouldn't it look distracting? What else would you shoot with other than the space bar? If you want it to feel like it's from the 80s then it's got to run at screen refresh rate. Anything but space bar and enter is good for shoot. Shift and Ctrl were popular for a while but it should be noted that tapping them repeatedly usually brings up an irritating accessibility dialog on Windows. And as for particles - knock yourself out Make those explosions count! I noticed that whenever you die though, you got ot he next elevel. I could send you all objects in png32 format, if you're interested. It should just restart the current level. I did redo the code though just to ensure that this can't happen (fingers crossed). I'm not sure what would happen if you got shot at the same time as killing the last alien on a screen though. To give 60 fps I'd need to generate a screen every 1000ms/60=16ms. At the moment on my, very moderate, hardware it can nearly run this fast however on older machines (my arcade machine for instance) it will run slower. You can see how long it takes to draw a screen on your hardware by pressing "t". This is just a test mode that also shows the level. At the moment if you get into trouble while playing you can press any key to bring up the shields - usually when you need the shields you don't have time to look for a particular key on the keyboard. I looked into using the shift and ctrl keys but it appears you need to use a different set of java methods to do this. Perhaps I should have a screen allowing the user to customise the keys. I tried upping the number stars but it affected the redraw time (is there a drawPoint method as I'm currently using drawRect(x,y,1,1)?). It also looked a little odd with so many stars - not bad as such but just a little distracting. I'll look into adding more bits into the explosion. Must admit I think your images are very good and I'd love to put them in. Problem is I draw the aliens etc using java draw commands (fillOval, fillRect etc) and I can't see how I could generate those images from that. I'm not sure how fast the game would be if I tried drawing images for aliens or what might happen when they overlap. I'm very impressed by your picture though - you obviously have a better imagination than me. Do people find the game too easy - I wanted to allow kids to play but wanted to provide a bit of a challenge on the higher levels (red aliens etc). Anyone get a decent score (>50k)? Did anyone get any stuttering during play or is it just me because I run a couple of database servers etc all on the same old box. I looked into using the shift and ctrl keys but it appears you need to use a different set of java methods to do this. Sounds like you're listening for keyTyped events for your keys? If so then you probably need to use the keyPressed method to pick up on keys like ctrl and shift. I got 56k when I played, and never saw any stuttering on my rather modest machine. The biggest problem to me was that it was a little slow, maybe speed it up a little? Also, getting the green bullets makes the game much easier - stay towards the middle of the screen when starting a new wave of enemies and you can often kill off most of them pretty quickly, since the bullets shot through baddies. I guess I'd also suggest maybe a different power-up or two, to vary the action a little more. Congrats - you've done a great job making it seem like an 80's-style arcade game. I've now improved the explosions so there's more bits flying about plus every explosion is now different. I did try adding a bit of gravity to make it look more realistic but oddly it looked more realistic without. You're quite right - I should be using these routines & I'll look into this shortly. I accept what you're saying but it's not really a game of super fast reactions - you actually need to think and shoot at the same time. I tried a faster version but the game quickly became impossible when the aliens turned red (let alone the later levels). At the moment a kid can wipe out a few levels and feel good with themselves while good players can get quite challenged on the levels after the red aliens. 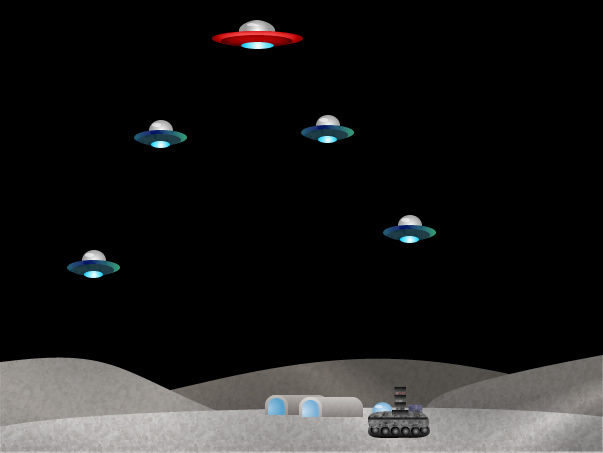 Each new type of alien and, to a lesser degree, each new level introduce different firing patterns and different alien behaviours which can make the game quite tricky. Getting a decent balance here is actually quite tricky in any game. Congrats on the 50k by the way. The player explosion looks a lot better now but takes a little too long. Adding explosions on enemy death would look a lot better than just vanishing. I noticed the star field doesn't stop animating when the game is paused. I still have a problems with hits not registering on power-ups. I'll look into that - I was a little worried about generating too many graphic items at the same time. I'll try it out though. I just thought it looked better but perhaps you're right - I'll freeze everything on pause. I'm afraid those things are just a part of the background image - I thought the game looked a bit more interesting when it had satellites flying overhead, rocket ships and comets etc. You can actually only kill the aliens and the motherships at the top of the screen - what you can shoot is all shown on the splash screen along with the points you earn. Obviously you can't shoot the planets and stars as they drift past either. I guess I could make the satellites break up on impact but they not a part of the invading force instead they are part of the civilisation you're defending - perhaps shooting them should count against your score? I'll make these changes latter today. OK, I think the other thing I couldn't shoot was a rocket. Your game really shouldn't stress J2D much, have you tried profiling it? I saw you say you draw the alien ships using severalGraphics2D.fill(Shape) commands. Do you do this for each ship every time you draw? If so, I think drawing each enemy type to a BufferedImage on init and reusing the images should speed up rendering. The rockets (satellites, comets, planets, stars etc) are just a part of the background - believe it or not I tried quite hard to give the scenery a cartoony realism - there's even the Belt of Orion in the star field! You can't shoot any of this stuff though. I mentioned above somewhere that maybe I should allow the user to hit these things (well the satellites and rockets) but then penalise them for doing so as they're on the human side. I do actually draw all the shapes individually - I wasn't sure what method you guys use but I'll look up the BufferedImage class. It's my first real time game. This might even allow me to use the aliens that derhannes produced - my son was very impressed by his artwork. I must admit I've got some very constructive feedback from this forum - it's appreciated. PS I recently added a cheat to jump to the higher levels immediately when starting a game (1=normal start, 2 bit harder, 3 harder, 4 very very tough). boss mother ships on the transition between levels (ie blue to green aliens). I might of made these too difficult to kill though. The progress of the game from easy to very hard is quicker now so you quickly find "your" level. Those less patient can start the game at the harder levels by pressing 1, 2 or 3 (medium to very difficult). Fixed the bug when it occasionally went up a level when you got shot. The aliens now explode but I tried to keep it subtle else it got distracting. It still looks like an old fashioned arcade game (I suppose Galaxians is sort of similar) but that's because that's what I wanted to create. I haven't done the BufferedImage stuff yet as it requires a bit of a rewrite. Well The game looks very different now. You might notice a "small similarity" to an image above but the previous image was a mockup and this ones a screen shot from the game. I'd like to give a public thanks to dehannes for helping me with the images The game still has a few improvements to be made but I think I'm getting close now. If you give the game a shot then why not put your name/alias alongside any scores. Getting better. Sound effects are good. Still running at 30fps and barely taxing my utterly rubbish laptop at all - gowaaaan, let's see 60fps. And more particles! Loads more particles! I've taken on-board a lot of the suggestions made and I think the games improved dramatically because of this. If your suggestion wasn't implemented then it was just because I didn't like the end effect when I tried it out. Cas, adding more particles just made the game look weird and I'm afraid I wasn't keen on the end effect and I also couldn't achieve 60fps on any of the PC's in my house so your "utterly rubbish laptop" ain't too bad! The game does try to match itself against the users ability so if you're slow shooting the aliens down then it progresses more slowly and you'll miss out on bonuses. Shoot the aliens down quickly and you'll get higher scores, a more difficult game and a faster heart rate. It's done this way to allow my kids (and their mates) to play while also giving more seasoned gamers an interesting game. I added a hints page to give other hints. Play lasts between 2 and 10 minutes depending on how good you are. Reasonable scores (>50k) take somewhere in between. I'm now planning to build an old fashioned arcade machine around the game but I expect that to take some time. If you get a chance then give it a try. I'll give it a play and a rating later today, okay? Thanks for giving it a look - it's a pretty normal retro-shoot-them-up. You shoot the aliens and avoid the rest. Power ups come from shooting the red mother ships and fire and damnation spews forth from the green ones which also need multiple hits to kill. I think you've got a good start here, and the fact that it runs completely smoothly and has no noticeable bugs is great. However, the big hit you took was obviously that this is just a clone with nothing interesting added to it - that docked you points from style, innovation, fun factor, and completeness. If you could just in general add more content and really make this your own then I think it could go from "a pretty normal retro-shoot-them-up" to a really badass and frantic little arcade game. I'm excited to see where you take this. I'm not too keen on making it too wildly different as I quite like this genre of games and the end goal is to put it into an arcade cabinet so everything from the ground up is my own but I'll try and think of different things to add. Can I ask how far you got (a rough score would be fine) just so I understand where you're coming from. Obviously do as you wish - being in the featured games section will probably bring you like 2 extra hits a month. That explains a fair amount - the game adjusts itself to the ability of the user so it progresses quickly when the player clears a screen quickly. 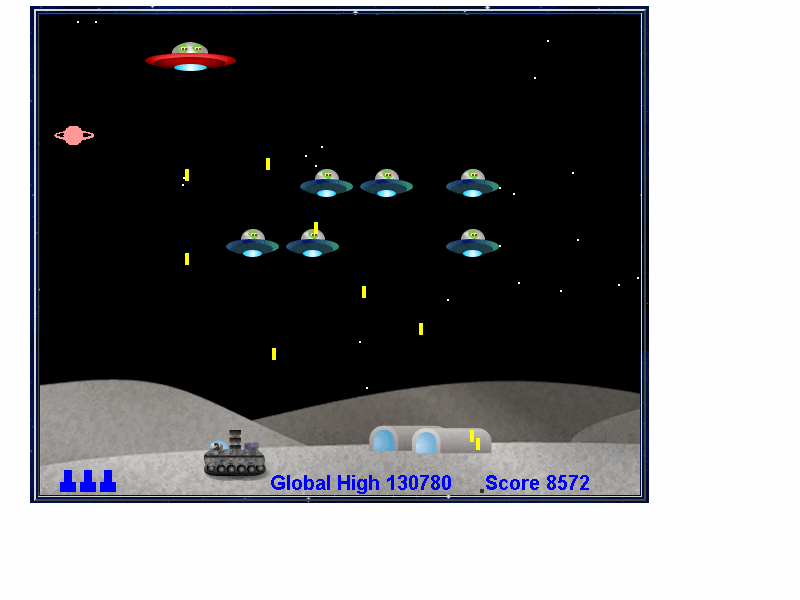 As the game progresses you get different aliens and each alien behaves and shoots differently. This allows my kids to play the game and feel that they've mastered things while a faster player could get everything thrown at them by screen 3. Your comment that you were bored indicates I need to progress things more quickly even for slower times. Getting a game to progress in a linear fashion is quite difficult - you want players to reach a level they're challenged by reasonably quickly but you don't want to slaughter those who are learning. I guess I need to rework this area. PS if you want to quickly try the game out at a hard level (and hopefully not get bored) then just start the game by pressing "4"
Okay, I'll give that a try when I've got a bit of time again. The games been redone (my 43rd attempt - I keep depressing docs on this type of stuff). The aim is to shoot the aliens before your time runs out, try not to overheat your weapon, get power ups etc and not shoot down your own stuff. It plays better, looks prettier etc. Any opinions welcome. looking much better and starting to get some polish, I especially like all the little touches you've added ships in the background and the aliens that popup. The game still has a slight look of a java applet game from the 1990's, this can however be remedied. 1) Get rid of all the default java colors that you've used, especially the yellow and blue. 2) Use a different font and not just the default Ariel Bold, there's plenty of nice free ttf fonts out there that you can use, get a nice one that fits your game theme. 3) The particle effects, don't look that good, use slightly bigger particles (small images if needed), doing this you may even allow you to get away with using less particles in each explosion and it'll look better then the fine dust looking particles you have atm. 4) you can have slightly better looking health bar (again get rid of the default colors), maybe use some sort of texture. 5) The yellow laser bullets aren't that good looking yet think its too much fade and blur on them, needs a bit more tweaking to get better contrast on them. Also consider using different colors for enemy and good unit bullets. Must say the planets in the background do look great. the high score system will store your user name? and is it any better?